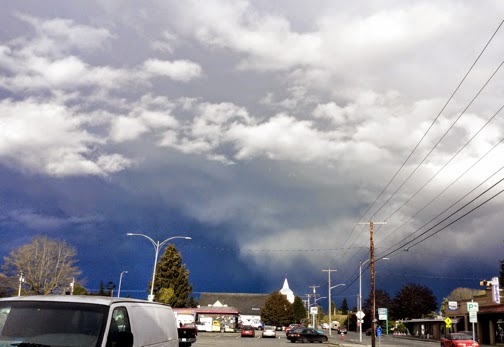 From the time I left the house Friday until I arrived in Sedro-Woolley, drama played out in the sky. For one stretch the clouds seen through my rearview mirror were black as a starless midnight while the fluffy white clouds ahead of me offered promises of smooth sailing. But they were false promises, as farther down the road rain thrashed overhead, forcing me to slow by twenty miles an hour, my windshield wipers as effective as limp noodles against the storm. As we neared the auditorium, the steeple of the Episcopal church gleamed as late afternoon sun broke through the ever-changing sky. So often life is like that. Decisions we make and events we cannot control pitch us from one trauma to the next, offering glimpses of glorious beauty, then dashing us back into chaos. In eastern Skagit County there is a group called Women HAND in Hand whose objective is to help women find God in their stories where, often, turbulance seems the order of the day. 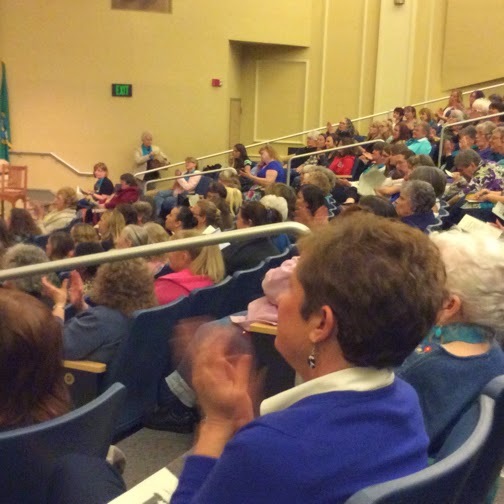 By hosting conferences that feature internationally known speakers, authors and musicians, they are bringing laughter, friendship, hope, encouragement and inspiration to the women of Sedro-Woolley, Darrington, and the surrounding communities. Ruth Graham, the daughter of Billy Graham, was the featured speaker at Women HAND in Hand's event over the weekend. I invited Mom to go with me to hear her speak. As she shared her own story, Ruth told how twice she found herself written into the story of the prodigal son. The first time, when her marriage fell apart, Ruth was resentful of her unfaithful husband and unforgiving, much like the older brother in the Bible. But later she herself became the prodigal, having to return home to ask forgiveness for her own sins. She reminded us that the father in the story was insulted by both sons, yet he gave them both unconditional love. So it is with our Heavenly Father, who redeems the saint as well as the sinner. He sings over us, delights in us, and says, "All is forgiven; welcome home!" But restoration comes only with our brokenness. While forgiveness is unconditional, Ruth told us, reconciliation is conditional, the condition being our changed behavior. And that requires our brokenness. She showed us how that looks as she shared her own life story with us. She encouraged us with the truth that there is hope in brokenness. Just like her father, Ruth Graham ended her message with an invitation. "If the Lord has spoken to you tonight, please join us in the front for prayer." Several of the Women HAND in Hand team members stood waiting to pray with any women who responded to Ruth's invitation. One particular team member caught my eye. She was radiant with the most open, welcoming face I have ever seen. She received each woman who came to pray with her as if she was her best friend. She wrapped the seeker in her arms, drew back to look her in the face, and moved right into the role of loving listener. And when it was time to pray, she held the seeker close as they prayed and cried together. And then they rejoiced, laughing, hugging, and praising the Lord for His victory. East Skagit County is rural and a long ways from the metropolitan centers where women have access to a plethora of opportunities for Christian inspiration and fellowship. But thanks to Women HAND in Hand, it is possible for Skagit ladies to enjoy rich fellowship and outstanding speakers in a loving, caring atmosphere presented with excellence and grace -- and all just a short drive from home. It's where they can gather to see God at work in their own stories. With a hammer in one hand and a nail in the other, I waited, body heaving, sobs rising up in gasping breaths. "Please don't make me kill my Jesus!" I silently screamed as the moments passed. And when at last I pounded that wretched nail into the rough wood the hammering thundered in my head and the tears streamed down. Traumatized, I turned to the communion table. 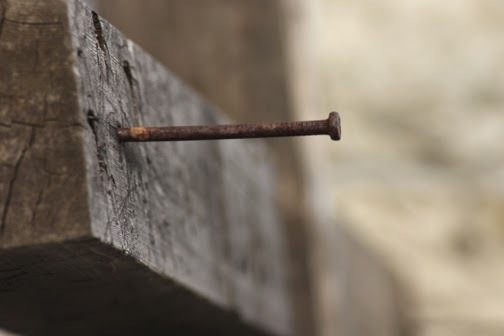 The bread – his brokenness in exchange for yours. Take, eat. The cup – his blood that washes away your sins. Drink. "The saving work is finished!" the sun goes dark as night.